I've been thinking lately about creative, fun ways to make more money. Maybe it's all these school district talks about 3.1 million dollars in cuts for the next school year, or maybe it's a new graduate school tuition bill, but whatever the reason, I decided to give photography a try. I've often thought of photography as a side project/hobby that was a creative outlet for me. But, after taking engagement pictures for family and friends, I decided that I like it enough and was good enough to do some work on the side, if anyone were to be interested. So, what is the first step? Pour my free time into make a website (I love making them). Did I ever mention how much I love them? Here's the finished "Bad Apple" bag, as promised! I love the way it turned out.... probably some of my best work. That's right, I had patience. Amazing. A while ago, my good friend, Mandi from Mandi's Musings, pointed out to me that I have a knack for loving the whimsical things in life. I was wearing a printed summer shirt with horses patterned all around it. She was right.... I didn't know anyone else who had horse-patterned shirts. The same thing happened a few months ago when she said to me, "Only you could find a blouse with owls on it." I've embraced this side of me and decided to combine my love of quirky, whimsical things with my new-found love of being a little more environmentally friendly. 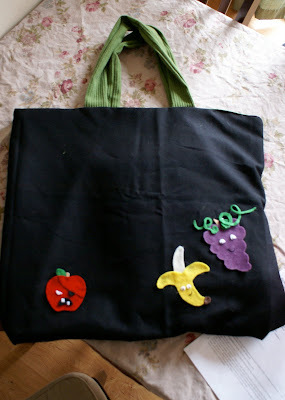 Thus, my new project is a reusable grocery bag with (what else.....) fruit on it! disappoint, either. It has chic dog-walkers and fun fire hydrants. Need some inspiration to eat a little healthier? Care to be less ignorant about the food we eat? Then watch the movie Food Inc. It's a scary documentary about what our food really is, how it gets to the stores and subsequently our tables, and how the farmer is really dealt the short-hand in all of it. I must warn you, it's not a pretty sight. Hidden cameras capture horrid sights. Workers for major meat industries (example Perdue) are kicking chickens unable to stand due to their genetically-enhanced breasts too heavy and over-developed for their legs. Forklift drivers are prodding lame, sickly cattle in hopes they will stand long enough to slaughter. And that's just the animals. The movie also documents how the big corporate heads of companies manipulate soybean and corn farmers. All the while, the consumer is led to believe by these few, major companies that all of our food comes from a nice little farm with a red barn and black and white cows roaming the lush, green land. It's past eleven o'clock, and I'm listening to my husband and old college friends have a jam session in the basement. We've truly had a boys' night with a trip to a barbeque joint for dinner, a Blues vs. Hawks hockey game, and now, a jam session. It's fun. We've had a blast hosting these guys. They've given us a good update on people we used to hang out with when we lived in Elmhurst, and we've definitely laughed a good deal reminiscing on old college stories. And while I don't miss Elmhurst's expensive rent or snooty stay-at-home moms, I do miss the great people we knew. We hung out with the music crowd, so you could always count on someone having a guitar and jamming out. But now, everyone mostly has jobs and live fairly boring lives. Glad to know we're right on par. And no one has had any kids, so it's another confirmation that I'm not "that" weird. Tomorrow, my good friends come back home from their extended Christmas vacation, so we'll be doing our usually Sunday night football with them. It'll be good to crack open some wine and chill with them. I've missed them. I've noticed a common thread in the blogs I follow: reflection on 2009 and hopes for 2010. I'm not one to stir the pot (well... I am, but not this time), so I'm following their leads. 2009 was an exciting year. It was the year that I had always finished with in my "Where I want to be in 5 years" plan. I accomplished my long-time goal of graduating with my masters, and I'm now a certified therapist. It feels surreal sometimes, but they keep paying me, so I guess it's for real. And, at the end of the year, my husband finally got the confidence and motivation to apply for grad school. He'll be starting in ten days! In other, non-education news, we bought our first car together and paid it off before the new year (thank goodness!). 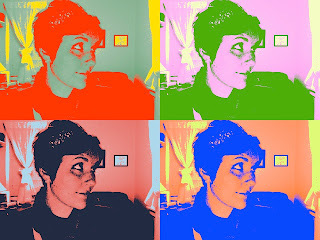 I also recently took the plunge and chopped my hair off (Randy's exact words, "Go short or go home."). It's the shortest I've ever gone, and man... it feels good (especially when it takes 5 minutes to do). We also decided that our love for dogs (pugs, especially) could be more beneficial if we volunteered as foster parents. Ever since, we've had five fosters and have loved them all. It's heartbreaking and rewarding far beyond belief. I've also met a great deal of wonderful people in 2009. I've never been one to have oodles of friends, but I can say that I've upped the ante last year. We met so many wonderful people through our pug rescue group, and getting hired on in a school helped as well. It's been really nice to hang out with people who share interests and hold good conversations. And, the fact we all enjoy wine is a nice common denomenator. I'm at a loss here.... like I said before, this is where my planning stopped. And I'm a major planner. So, 2010 might be the year for me to cut a little slack... be more spontaneous.... explore a bit. I'm not setting myself up for failure by committing to a resolution, per se. But, I do want to live a healthier lifestyle. I'm already getting ideas for our new garden. Thanks to my friend, Christine, I'm giving into the neti-pot, which is amazing! It might be the clearest I've breathed in a long, long time. So, we'll see where 2010 leads me. I'd love to think that Randy and I will be traveling, but with his job and grad school, I think we'll have to wait a few more years before major travels take place. It's been something I've dreamt of doing, but priorities are what they are. It's time for me to be supportive of my husband, just as he always has been of me. Besides, we have time.... like when we both have summers off. Welcome 2010! We're gonna have a good time.